There has been a lot of news recently about the radiation leaking from the Fukushima plant into the ocean. I read a variety of articles on the topic but found I still didn’t really comprehend in an intuitive way the amount of radiation that is escaping the plant. The leaks tend to be given in a combination of units: quantity of contaminated water (usually tons) and radiation dosage (usually becquerels). I am pretty good at relating to water quantities but not so good at relating to becquerels. How much is actually leaking, using units that I can relate to? Of course the easy answer is that any radiation is bad and the additional leaks discovered in August are a frustrating disappointment, but still, how much is it really? Is it a bad day at the dentist? Is it a bad day a Chernobyl? More likely it is somewhere between the two but I want units that I can relate to. While I will be the first to concede that irradiating our bodies or our food in any way is not a great idea, it is also important to make sure we keep things in perspective and spend our collective efforts managing the most dire and pressing issues. Fukushima is spilling radiation at about 25% of the rate at which radioactive material is produced from the average, normally operating coal fired plant. The leaks are still bad. Water dilutes slower than air so local creatures are in a pickle for sure. The slow action from the company, TEPCO, is frustrating if not surprising. Fortunately, the radiation monitoring is better than the leak monitoring – that is what suggested there were undiscovered leaks. This complex problem needs attention and it could certainly get worse if something breaks. But this isn’t even close to being the worst thing humans are doing to each other or the planet right now. If you want to some technical reading on the topic, Scientific American did a nice piece. 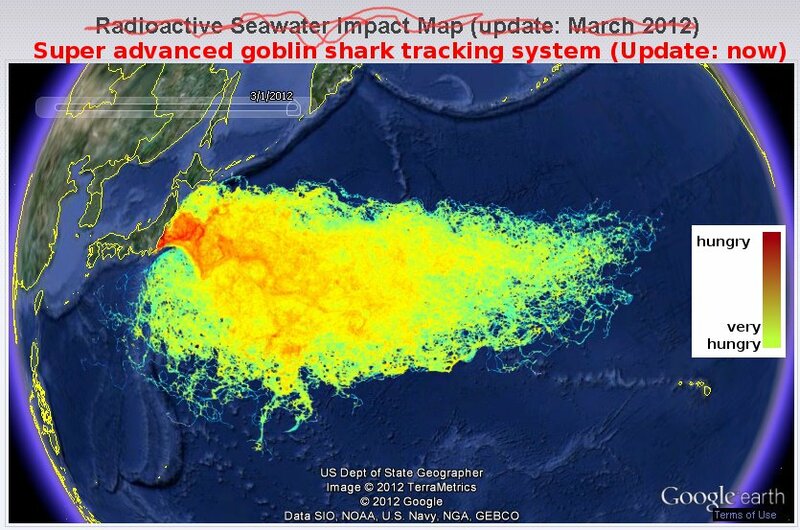 Also, many of the images circulating that purport to show radiation flows are bunk. Be sure to look at the units when viewing these images. Some are actually old charts showing the amplitude of the tsunami wave itself back in 2011, not of radiation. Some others say “units arbitrary” or have no legend at all which is even more useless. In those cases I like to assume the colours represent goblin shark movements. Whatever an article may say subjectively, if they show diagrams without units they have a glaring lack of credibility and the diagrams themselves are meaningless. Don’t forward those pictures to your friends. This entry was posted in Ramble and tagged Fukushima, pollution, radiation, science. Bookmark the permalink.